Living The Artist's Dream: Finding Some Quiet Time..HA. It seems like everytime I sit down to work someone needs something. Lola wants water, woof woof, Sammy wants attention, in your face wiggling then Ozzie wants to play. A tennis ball on your lap. I realized today that I didn't retire, Roger did. So we chatted and he understands that I still need to paint. It's my addiction and it makes me feel good. I decided today also to include our adventure to Georgia and Myrtle Beach in the comic of Lola and The Boys. So far 22 pages of the kids and their seeing the Country Coach and the move from the house to the RV. 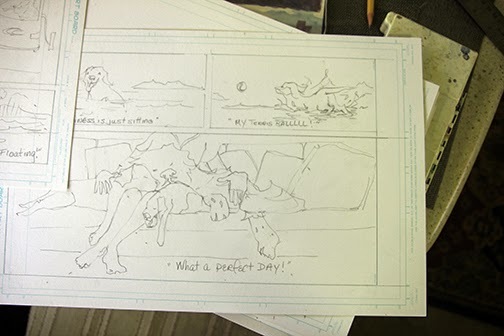 A few more pages then I'll do the coloring and inking. 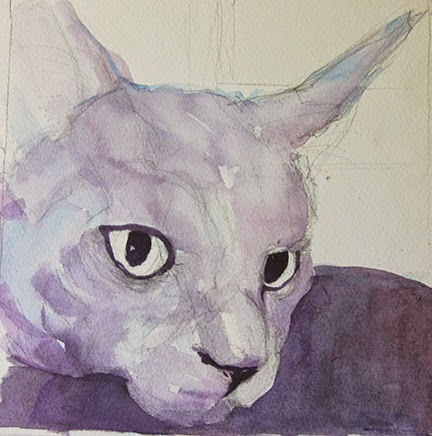 I also got a chance to work a bit on the watercolor of the cat. As you see I love working with purples and blues. I will of course, and hopefully, adding a discord color near the end of the piece. We didn't get to the dog park in Smyrna Beach the other day. The heat index was in the 90's and Lola in her fur coat, not to mention me, would have melted. We are going to see how tomorrow fairs when we get up. Time to end and clean up my mess on the dining room table. sigh. See you tomorrow! !